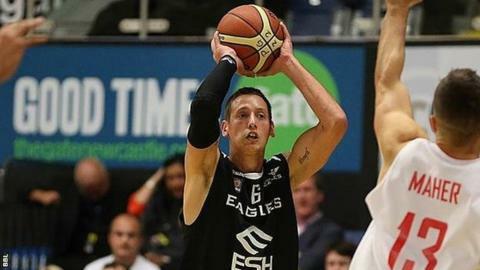 Guard Stuart Thomson is desperate to help Newcastle Eagles beat former club Worcester Wolves in Sunday's British Basketball League play-off final. Thomson was released by the Wolves less than two months into his contract last season and joined Cheshire. He then followed in the footsteps of brother Andrew in linking up with the Eagles last summer. "I'm competitive, I have a chip on my shoulder," Thomson told BBC Newcastle. "For me, it's just about beating them." He added: "It's my main goal. I want to see them lose and us triumph." Despite the terms of his departure from Worcester, the former Catawba College college player respects the challenge posed by his former club. Under coach Paul James, Worcester have become an emerging force, after they reached the BBL Trophy semi-finals last year and went on to win the competition this season. "They're competitors, that's what they do," Thomson added. "They won the trophy and I'm sure they want the second one. "But it's a good match-up, mano-a-mano, we've got Darius (Defoe) and Malik [Cooke] who can go against them. "I have all the confidence in my team-mates and what they can do. It's more about what we do than what they do as far as I'm concerned."